Sheila Conlin, of The Conlin Company, on Integrity, Male Grooming, and Her Incredible Evolution in Reality TV! 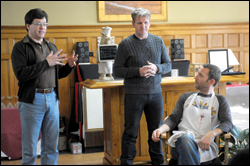 …“Hotel Hell” premiered on Aug. 13 and will conclude its six-episode inaugural season tonight with back-to-back episodes that will focus on the River Rock Inn in Milford, Penn., and the Roosevelt Inn in Coeur D’Alene, Idaho. …After two weeks of unstoppable Olympic momentum, NBC ceded its ratings crown to Fox on Monday night. With the premiere of Gordon Ramsay’s Hotel Hell and the return of original broadcasts of Hell’s Kitchen, Fox averaged a 2.3 rating among adults 18-49 and 5.8 million viewers for the night. Produced by One Potato Two Potato. Executive producers, Gordon Ramsay, Ben Adler, Patricia Llewellyn, Adeline Ramage Rooney; co-executive producers, Jonathan Chinn, Jay Hunter; supervising producers, Pip Wells, Ryan Simpkins; producer, Sheila Conlin; senior story producer, Max Poris; music, Jeff Lippencott, Mark T. Williams. 60 MIN. Check out this article about Sheila Conlin’s panel at the Nashville Screenwriting Conference 2012! …In a panel called “The Reality of Reality Television: What Works and Why,” four non-fiction TV veterans will review the ins and outs of working in the medium. …Fox’s alternative programming boss, Mike Darnell, was interested in bringing the program to America. “What he liked about the show was the heat of the kitchen, the pressure atmosphere and the title — he always loved that — as well as Gordon as the central figure,” says Paul Jackson, a former ITV executive who helped sell the show to the network. But Darnell would only buy Kitchen if the stripping format was dumped (2003’s I’m a Celebrity … Get Me Out of Here!, also from ITV and likewise stripped, had fared poorly on ABC) and the fame element similarly excised. When the videotape ends, Dr. Phil turns to Sheila. “OK, the odds are long,” he muses. Alphabet net will preem a two-hour edition of “The Bachelor” on Monday, Jan. 5, followed by the launch of “True Beauty” — the formerly untitled reality competish from Tyra Banks and Ashton Kutcher. The following week, “The Bachelor” will shrink down to its normal 90-minute frame, leaving room for “Samantha Who?” in its regular 9:30 p.m. slot. “True Beauty” continues at 10. “The Bachelor” fills the void left by “Dancing With the Stars,” which returns in the spring. “True Beauty,” meanwhile, takes over for “Boston Legal,” which finishes off its series run later this fall. Next “Bachelor” reps the 13th edition of the romantic reality skein; Jason Mesnick, who was turned down by DeAnna Pappas in the season finale of the last “The Bachelorette,” will star as the new Bachelor. Meanwhile, the Alphabet has kept details of “True Beauty” under wraps. But the show, from Warner Horizon, Bankable Prods. and Katalyst, revolves around people who live in a house together and compete in a beauty pageant. It sounds a little like an old joke: A salesman from Tampa walks into a Miami bar with friends, hoping to have a little fun. Even now, Joel Rush admits that when a woman came up to him in that bar, claiming to be a casting agent for a new reality show on ABC, he reacted like it was a joke – buying her a drink and thanking her for the funny story. But then he noticed the line of people crowded around. The casting agent explained that Rush seemed perfect for a new unscripted “reality TV” show the network was developing on beautiful people. Six months later, Rush is planning a quick exit from his sales job at Pegasus Imaging in Tampa, calling news outlets and readying a move to Los Angeles following his role on True Beauty – a new reality competition show developed by actor/entrepreneur Ashton Kutcher and model/mogul Tyra Banks. Rush eventually spent six weeks in Los Angeles around October, hanging with nine other beautiful people, host/judge Vanessa Minnilo (TRL, Entertainment Tonight), sixtysomething supermodel and judge Cheryl Tiegs and judg//fashion consultant Nole Marin (America’s Next Top Model). The contestants were given one outer beauty challenge and one inner beauty challenge for each episode – their behavior captured by hidden cameras and evaluated by the judges. Only after a contestant was eliminated was the truth of the competition revealed to them. The prize at stake: $100,000 and a spot in People magazine’s 100 most beautiful people issue. Rush describes a production unfolding like a mishmash of existing reality shows — a bit of MTV’s The Real World here, a little of Banks’ America’s Next Top Model there, with a dash of Kutcher’s signature prank show Punk’d. And contestants had no clue of the show’s true endgame until they were ejected from the contest. An Indiana native, Rush moved to Florida six years ago after college, chasing opportunity. As True Beauty airs its eight-episode season in early 2009, he’ll be chasing it again in Los Angeles, trying to further his modeling and acting career on the connections he’s made doing the show.